2 Pillow Pets for $15.00! You can get 2 real Pillow Pets for only $15 at KGB Deals! There are over 30 pets to choose from, so you're sure to find your child's favorite animal. NOTE: Shipping isn't included. 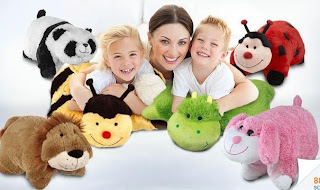 It costs $8.95, so that comes out to about $12 per Pillow Pet, which is still a great deal!